Map created after the 1906 earthquake showing the locations of broken water mains South of Market and in the Northeast Mission. 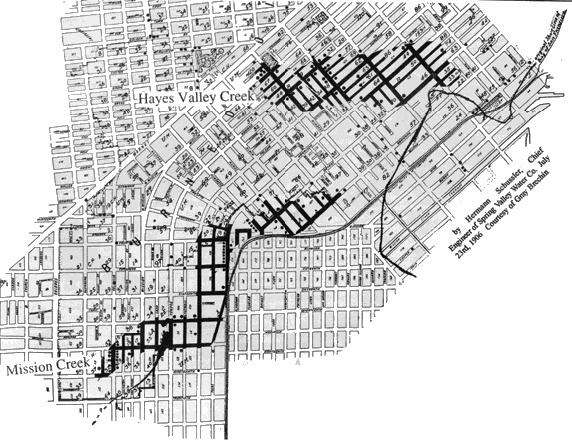 Heavily damaged areas are concentrated in the low-lying areas along the old Mission Creek (18th Street) and Hayes Valley Creek where it drained into Mission Bay south of Market and just east of the old City Hall. In this community newspaper article, the author highlights one of the greatest safety concerns for the economically prosperous city of San Francisco of the early 21st century: the massive expansion of construction in locations that are known to provide major earthquake hazards. Increased development around the turn of the century in low-lying areas where building have been constructed on soft mud foundations with poor infrastructure, present major concerns of preparedness for the next big San Francisco earthquake. The city has many obstacles around fragile water mains and adequate transportation it must tackle in order to insure certain areas of new growth are prepared for future quakes. One topic often omitted in the debates over real estate development in the industrial lands of South of Market and the Northeast Mission, is that most of the new building construction is occurring in locations where San Francisco's soils are the least stable and the most vulnerable to earthquake damage. Our industrially zoned districts are primarily located in the low-lying areas around Mission Bay. These areas were originally tidal marshes filled in fast and furiously with sand and mud during the Gold Rush days and shortly thereafter. The more stable lands on the hillsides were built with housing, since only commercial concerns could afford the high costs of landfill. Gray Brechin, a geographer from U.C. Berkeley has written a new book called Imperial San Francisco; Urban Power, Earthly Ruin, which scrutinizes some the processes of urbanization in San Francisco, and the immense wealth acquired by a few at the environmental expense of succeeding generations. He maintains that California was filled, poisoned and plundered in order to grow and feed its urban aristocracy; and that much of this can still be seen going on today in San Francisco. "This is especially true in the current land rush to build on every available parcel in the South of Market and the Northeast Mission," Brechin claims. One of the more colorful examples of the tremendous environmental impact some of our founding fathers have had on this City begins when Americans first took possession of San Francisco in 1846. Our political leaders at the time, SF Alcade (Mayor), Edwin Bryant, and General Kearny, the California Governor, immediately began the process of selling off plots of underwater land along the waterfronts. This scheme raised enormous amounts of money for the new government and powerful new landowners, but has left lasting negative consequences on the land ever since. Aside from the loss of our natural terrain as hills were leveled to create soil to fill the water-lots, commercial and industrial activities over the years have left toxic remains, only to be cleaned up today at enormous cost to subsequent generations. Brechin is particularly concerned about the infrastructure of the City when unstable areas are pushed to their buildable limits with new construction. Many individuals have complained about the seismic instability of the huge new live/work buildings constructed in South of Market during the years of contentious public hearings. But Brechin has brought more questions to light. "What people don't realize about the devastating 1906 earthquake is that it was the inability to fight the fires that destroyed the City, not the earthquake itself. The underground water mains failed in concentrated areas of South of Market and the Mission." According to Beverly Hennesy of the SF Public Utilities Commission (SFPUC), San Francisco has recently undertaken a massive capital infrastructure upgrade, which could total $3.5 billion over the next 15 years. As part of a comprehensive Facilities Reliability Study by the SFPUC, they simulated a seismic event (a 7.9 quake on the San Andreas Fault somewhere along the Peninsula) and found that our regional water supply would be unavailable within hours of the earthquake and not restored for 20-30 days thereafter. With funds from Water Bonds approved in 1997 they are now, among other things, replacing brittle underground water pipes susceptible to rupture. They are also rehabilitating City reservoirs, many of which are 60-100 years old and built to less rigorous standards. To increase storage capacity and supply, they also plan to create a new reservoir for the eastern side of the City and downtown. Where does the Mission fit into their plans? "The senior levels of our planning group are still in the process of prioritizing the work that gets done," said Hennesy. In the area of the broken water mains along Mission Creek indicated on the map, there have been only a few new buildings constructed and many more have been substantially reconditioned. The general area from 17th and 18th Streets and Mission to Harrison would appear particularly vulnerable from this map, and should be subject to careful planning for future land use and improvements. Recent large scale rehabilitations within this area include: Green Glen Linen by SKS investments, Allied Box Factory, Mark Ross Building at 19th and Harrison also by SKS (listed for sale), Lili Ann at 16th and Harrison, and the new John O'Connell High School. New loft buildings were constructed between 17th and 18th along Harrison, plus a couple of small buildings on Folsom and South Van Ness are within the highlighted area. One big site that still needs a major seismic upgrade or replacement is the long industrial complex on the west side of Folsom between 17th and 18th, which was heavily damaged in 1989. The proposed new uses have been controversial. In many of the early public hearings about loft development, the question of whether to encourage so many new buildings on the unstable soils of South of Market was raised over and over again. Since driving concrete foundation pilings through soft mud all the way to bedrock was determined by the developers not to be cost effective when bedrock can be 100 feet deep, a new foundation system was developed and is now used routinely in these areas. These new "mat foundations" are essentially floating concrete slabs, typically about 3 feet thick. Debra Walker, SF Building Inspection Commissioner, expressed concern about the warnings made in many of the engineering soil reports which state (for example, from the loft buildings on Harrison Street between 17th and 18th Streets) that "the buildings will be subject to differential settlement". In other words, while the buildings themselves should hold together fine, they may settle or tilt over time with repeated earthquakes and the gradual shifting and settling of the substrate. The Building Inspection Department for San Francisco maintains that new buildings are safer than ever. "We have learned a lot in the last few years from recent earthquakes in other cities, and it is important to upgrade and/or replace the older buildings in these liquefaction zones where they are often unsafe." Catherine Bauman, a senior planner in the Long-Range Planning Group of the Planning Department, also maintains that "encouraging development in the soft soil areas of the City serves to improve the seismic safety of the areas. To restrict development and discourage improvements to the deteriorated buildings, be they smaller and less dense, does not enhance or preserve seismic safety." Accelerated growth and development without adequate transportation improvements can lead to serious environmental problems-like the traffic congestion and air pollution we are all familiar with. And in an emergency situation, it could also be very debilitating if people were to become stranded far away from home for an extended period of time. The rapid real estate development currently underway in this immediate area is not accompanied by adequate transportation improvements to accommodate the increased population, especially as residential development sprawls further and further from the job centers. "Damaged streets will be difficult to move fire trucks through, yet they keep increasing the construction in these land-fill areas," says Brechin. Another concern expressed by Brechin is the increasing cost of real estate in San Francisco, which prevents many of our public emergency personnel from living in the City or in close proximity. "There are fewer firemen on staff today than there were in the 1906 earthquake," claims Brechin "and our hospitals are all operating beyond capacity, such that they cannot handle a large scale emergency...We do have a salt water cistern system that we did not have in 1906 to fight fires, but it didn't work in 1989 and I am not sure why...Preparedness is the question. I moved away from San Francisco because I don't want to be there when the big one hits," said Brechin. But he also added that he currently lives nearly on top of the Hayward Fault! Is the Mission getting our fair share of infrastructure upgrades to accommodate the increased density and congestion in our neighborhood? Where will the big investments in our fundamental infrastructures be made? We know a huge percentage is going into Mission Bay where the big cats have their money invested with Catellus, just as Brechin's thesis would predict.